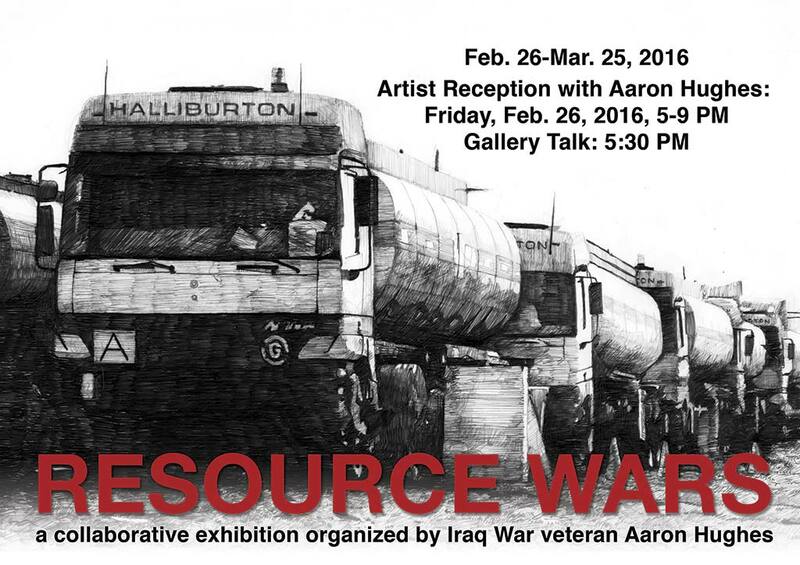 “From the companies involved, to the communities most impacted, to the underpinning economic and political interests, there is a haunting mirroring between wars and occupations abroad, and resource extraction here in the United States.” Resource Wars is a collaborative residency and exhibition by artist, activist, and Iraq War veteran Aaron Hughes that explores the relationship between resource extraction in Pennsylvania and wars abroad. Hughes will be an artist in residence at Lycoming College in February, creating a collaborative wall installation with Lycoming College students, faculty and local artists. The installation includes prints from four Justseeds Artists’ Cooperative print portfolios highlighting the issues of war, resource depletion, and climate change: Resourced, War is Trauma, We are the Storm, and Celebrate People’s History: Iraq Veterans Against the War. Resource Wars is presented in conjunction with the Lycoming College Spring Symposium on Veteran Issues. More information can be found on the gallery’s website. You can also read more from Aaron and collaborator Kevin Basl on our blog. Wednesday – Friday, 4-8 p.m.
Saturday 11 a.m.–2 p.m. and 5-9 p.m.